Yesh Atid head tells journalists he will run for PM in next elections, and 'separate from the Palestinians' by giving them a state. 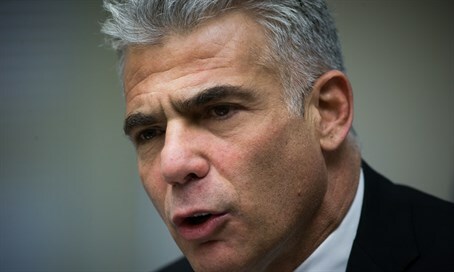 Speaking at the Jerusalem Press Club on Monday, Yesh Atid chairman MK Yair Lapid declared that in the next elections he will run for prime minister, reiterating his past statements declaring he intends to lead the country with his "centrist" approach. Lapid promised to "offer a way forward for a better Israel," in comments ahead of a Wednesday motion calling to dissolve the government. The Yesh Atid head also said that the next conflict is merely a matter of time, noting that Hamas and Hezbollah's incitement and breaching of the quiet with Iran's backing is paving the path to the next war. These are not easy days for our country. We are under attack. An ongoing terror wave of stabbings and ramming with cars by Palestinians. Just this week a mother of six was killed in her home, while protecting her young daughter. The day after, Michal Furman, the wife of a dear friend of mine, was stabbed in a shop as she bought shoes for her daughter. She is five months pregnant. She saw a young man, went to ask if he needs any help, and he pulled out a knife and stabbed her. What kind of people do that? What kind of people try to kill pregnant women who have done them no harm? Surviving in this hostile neighborhood is an achievement. Building a flourishing economy, a vibrant democracy and a strong society is miraculous. Israel is a miracle and we can never take it for granted. But it can also be better. Our society can be stronger, we have potential that is still untapped and we have major challenges which we need to do a better job dealing with. At the next elections I’ll be running for Prime Minister, and will ask the Israeli public for their support. We will offer a way forward for a better Israel. We will campaign as a strong political center that loves this country and has a vision. A vision for solving the Israeli-Arab conflict. A vision for strengthening Israeli society. A vision for repairing our international standing. I want to highlight three key issues before we go to questions – Iran, a regional initiative, and Israel’s international relations. The first you all covered. After the signing of the JCPOA (nuclear deal - ed.) we need to re-assess our approach to Iran. We’ve said what we think about the deal, but there is another problem. The international community acts like this deal has made everything else Iran is doing kosher. Nothing – nothing! - is further from the truth. There is no evidence to suggest Iran is moderating – it still crushes dissidents, arrests journalists, hangs gay people from telephone poles, suppress women. And most concerning from our perspective (it) is still the leading global sponsor of terrorism. Secretary of State (John) Kerry said himself last week that some of the sanctions relief will go to funding terrorism. For us this is not theoretical. This money will translate itself to rockets aimed at our children. I want to say something that I hope you remember – the next conflict in the north or the south of Israel, is just a matter of time. As we sit here there are around 1,000 people digging terror tunnels in Gaza, some of them under the border and into Israel. In Lebanon Hezbollah has more then a hundred-thousand rockets aimed at us, and terrorists with combat experience who will return home from Syria ready to fight. So the next conflict is just a matter of time, and when it happens the world will look and ask – “why?” So remember this – the provocations, the breaches of international law, the preparations - are already happening every day by Hamas in the south and Hezbollah in the north, both with Iranian backing. When the next round of fighting breaks out, the analysis and the reporting shouldn’t start with the first Israeli strike, but with what’s happening on the ground right now. Too often in the past the media has placed the blame at our door step despite clear evidence. Don’t wait until the next operation, go down to the Gaza border now and hear first-hand from the people living there about the digging noises. Go to the northern border and hear from the IDF about Hezbollah’s preparations for war. Yet, it isn’t enough for Israel to respond – we also have to initiate. A few months ago I presented the people of Israel with a plan. The aim is separation from the Palestinians through a regional summit which will serve as opening salvo for a comprehensive regional agreement. The advantage of this initiative is that it doesn't look to reach an agreement only with the Palestinians, but full and normal relations - diplomatic and economic - with the entire Arab world. The details may be complex, but the basic idea is simple – Israel doesn’t want to absorb 3.5 million Palestinians. It is time to separate and guarantee our future as a Jewish and democratic state. Yet, a Palestinian state will only come about through an agreement - terrorism and international pressure will not move us towards such agreement. The perceived wisdom today is that peace between Israel and the Palestinians is not possible. Some believe the point of no return has passed, others are waiting for a change in circumstance or a change in leadership. The underlying assumption might seem to make sense, but this passive approach to our destiny is misguided and dangerous. We need an approach based on pragmatism and genuine security for both sides. The answer is separation. As decisively as possible. The security coordination which exists today – and allows the IDF to act across the West Bank - must continue even after the separation. The Palestinian Authority will shout and claim that this is a breach of their sovereignty, but they know it is also in their own interest. If not for such coordination, Hamas will rise to power in the west bank the same way it did in Gaza. We will not allow it, and it is also the PA’s worse nightmare. We cannot allow a terrorist state on our border, we cannot allow a repeat of the process after the disengagement from Gaza. Finally, we must work to rebuild our relationships with the international community and especially our closest ally the United States. Rebuilding our foreign relations is based on two things – hard work and a clear message. The world has to know exactly what we want and we have to invest time and energy into diplomacy.